When you create a quiz in Zunos you’ll be prompted to choose from two different quiz types: Standard and Chat. Choose one that is relatable to the content of your training and the circumstances of the test. Standard style quizzes have more question types to choose from and are better for quizzes rich in content. A chat quiz is a less formal approach and is best for continued learning, or to simulate a sales conversation. Quiz settings are crucial and could make or break your quiz. Points per correct answer are important if your learners are competing against each other on the leaderboards. Every single point counts, so make sure to include them! Add a passing mark if it's necessary for your learners to pass before moving forward. Communicate this early to give learners a heads up on what to expect. Hide quiz answers if you're wanting to test user knowledge rather than reinforce key information. Randomize the question order so no quiz is the same and learners aren't tempted to get answers from other colleagues. In a Standard quiz type, you have the option to add three different styles of questions: multiple choice, true/ false, and sequence. Multiple choice style questions present learners with a variety of answers to choose from. Add your answers and choose one or multiple answers from the list to be correct. True or false questions give the learner a 50/50 chance of picking the correct answer and are effective for recalling facts, statements, and/or policies. Finally, sequence questions allow you to test learner knowledge on things like the chronological order of events and the correct steps in a process. In a matter of one hour after presenting new content, your learner’s brain will start to forget important information. Make things stick by following up new content with a quiz. Every. Single. Time. This will help users retain more information and ensure you haven’t wasted energy and time on creating content that is easily forgotten. Use a variety of quiz and question types to keep things interesting and engaging for your learners. Include your quizzes in a course to keep learners on track. Set up new content and quizzes in modules, and then add them to a course. All of the information in a course can be set in a sequential order, so learners take in information as you intended, without skipping around. Now that you’ve figured out the structure, it’s time to turn information into knowledge by writing the right kind of questions. Here are some things to consider when writing your content. Skip the vague, confusing language or trick questions. The end goal is quality retention, not tripping up your learner. Be as clear as possible and include the details that really matter in your quiz questions. Include concrete examples and real-world scenarios in your quizzes to help turn knowledge into power. 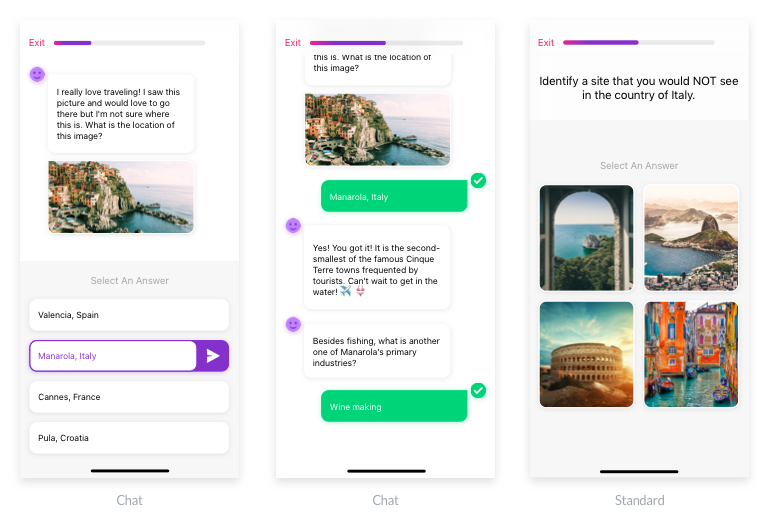 Stories stick and give your learner examples of real-world application they can call on at a later date. Repetition is key to increasing knowledge retention. Make sure your content and quizzes build off one another by weaving familiar concepts into new content you are teaching. Do the same with your quizzes by pulling questions from previous assessments and repeating them in quizzes later in the module. This keeps your learners on their toes and helps prevent information from being lost. When using examples, include the same story or fictional character in both the content and the quiz to help create a familiar scenario. Make your quiz memorable by attaching media and images. Visual learning is very efficient and delivers great results. Attach media you wish your learner to remember by loading the content to the questions under “media link.” If the content isn’t already in Zunos, you will need to load it before attaching it to your quiz question. Don’t skip out from providing feedback on your quizzes. Users like to get real-time results, rather than waiting around to see how they did. Under each possible answer, you can build out feedback for your quiz takers. Inputting feedback is a great way to quickly provide more information to learners and saves the admin time. Note, feedback is delivered after the user selects and submits an answer. If you see users consistently missing the same questions, it may mean you need to alter your question or provide better learning materials. Pay attention to the results you’re getting and make improvements when needed. Feedback on answers is highly important in a chat type quiz. This quiz style is designed to help learners feel as though they are having a discussion, so make sure to include feedback with every question to keep the quiz flowing. Schedule your quiz reports to run in advance so you can always stay on top of learner progress. Feeling confident about quiz writing? Start creating your own quizzes by logging into the admin portal. Or read more relevant quiz articles below.